There may be a two-week break in August when the teacher is on holiday. We’ll try to accommodate student holidays as well. The A1 Conversation Skype class is certified by the Ministry of Education in Luxembourg and qualifies for the 24 hours of Luxembourgish lessons needed to receive the Luxembourgish nationality if you've lived in Luxembourg for at least 20 years. How do I know this class is for me: If you have a good understanding of the grammar and conversation topics explained in the Learn Luxembourgish book, or if you have taken our A1 Basics course (or other A1 level courses), you are probably ready for the A1 Conversation class. The emphasis here is on speaking, speaking, speaking. It will allow you to put your basic knowledge into practice and start speaking about the topics of the A1 level (A1 refers to the beginner level of the Common European Framework of Reference for Languages). You will not only be able to form your own sentences but also have short, basic conversations. How is the class taught: The class takes place online through Skype once a week for 12 weeks in a row. Each lesson is 60 minutes long. The class is mostly taught in English while more and more Luxembourgish is introduced as the course progresses. After each lesson you will have access to online notes that summarize the activities of that day’s class. How much work is involved: The preparation work for each lesson includes reviewing chapters of the Learn Luxembourgish book as well as studying additional vocabulary and grammar pertaining to each lesson (material made available to you in advance of each lesson). At the end of each lesson, voluntary homework will be given so that you can continue learning on your own time. What are the topics covered in the course: dealing with administrations, small talk during social events, making and replying to an event invitation, talking about your likes and dislikes, leading a conversation with your doctor, talking about what you do at work and answering interview questions, talking to a real estate agent, getting to know Luxembourg and having conversations in different kinds of stores. If you have a little bit of a background knowledge in Luxembourgish, this A1 Conversation course is your first step in getting ready to take the exam. 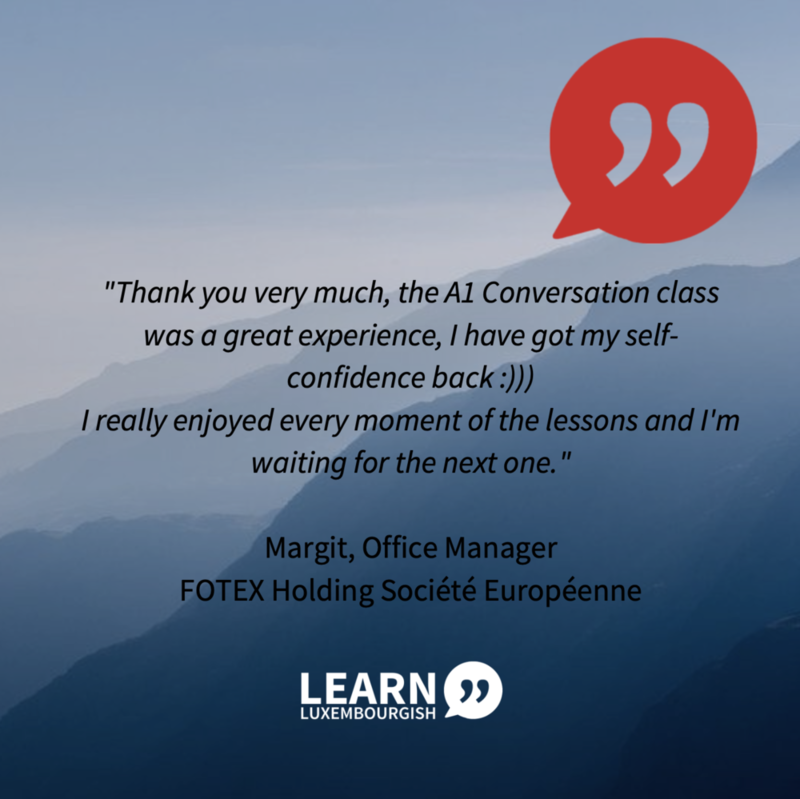 There is a 50€ non-refundable deposit on this A1 Conversation class in order to reserve your spot. Cancellations are accepted until immediately after the first lesson. Please specify which day of the week and time of the day works best for your classes (and please add your timezone).